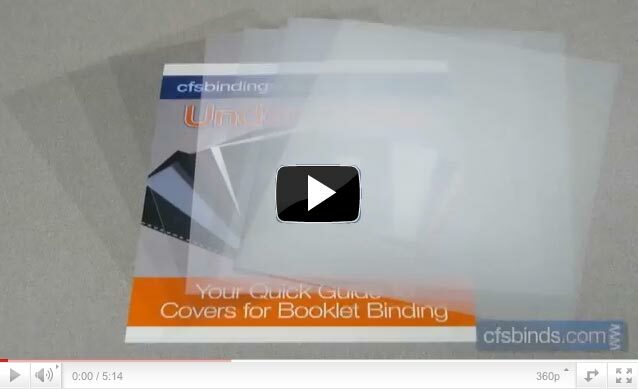 This month we have prepared a brief video overview of clear covers and frosted/matte coversused for booklet binding. The video clip below offers a brief description, close-up views of the textures, and the thickness/rigidity/durability of each cover. As an added bonus we have obtained ‘top secret’ footage from the CFS Test Labs showing highly scientific testing methods to evaluate each covers characteristics. Available in a variety of sizes starting at 8.5” x 11” – up to 11” x 17” ledger size, these are all popular choices as front covers for booklet binding, often paired with a composition vinyl back cover. Do you have a creative use for clear covers or frosted/matte covers? Share your projects as a comment below.